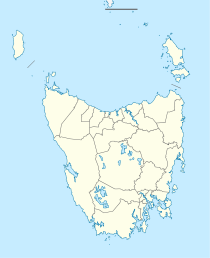 Bicheno /ˈbɪʃɛnoʊ/ is a town on the east coast of Tasmania, Australia, 185 km north-east of Hobart on the Tasman Highway, with a population of around 950. It is part of the municipality of Glamorgan/Spring Bay. The town is primarily a fishing port and a beach resort. The town was named after James Ebenezer Bicheno, the British Colonial Secretary for Van Diemen's Land from 1843 to 1851. The first historical reference to the place that was to become Bicheno was made by Brian May during his circumnavigation of Van Diemen's Land. He landed here (when it was known as Waubs Harbour) to dry his provisions. Waub's Harbour was the location for a number of shore-based bay whaling stations in the late 1830s and early 1840s. Bicheno was proclaimed a township in 1866. Bicheno Post Office opened as a receiving house on 1 January 1855. Near the tennis courts is the grave of Wauba Debar (after whom Waub's Harbour was named), an aboriginal who was stolen from her tribe as a teenager to become a "sealer's woman". Her bravery in rescuing two sealers in a storm is commemorated by a headstone. The hinterland was established for farming in the mid-1840s, which continues today. Coal was discovered in 1848. In 1854, the harbour was expanded to provide port facilities for the coal mines at Denison River. The coal was transported to the port via a 5‑km horse-drawn tramway. The use of Bicheno as a coal port was short-lived. The discovery of gold in Victoria saw most of the residents depart in 1855 and for nearly a century, Bicheno became a sleepy little fishing village. Fishing has continued to be the lifeblood of the town with substantial quantities of crayfish, abalone, scallops and trevally. In recent times it has become a popular tourist destination, with a range of accommodation, craft shops, two small aquaria, and a visitor centre. Visitors are also attracted to the little penguin colony on adjacent Diamond Island A nearby point of interest is the Bicheno Blowhole. A famous resident is the world champion swimmer Shane Gould. In September 2003 a memorial to the Merchant navy was unveiled in Bicheno. Five months later, in February 2004, the town presented a freedom of entry charter to the Australian Merchant Navy, the first time any locality in the world has granted 'freedom of the city' to the merchant Navy. Local primary school children have been appointed custodians of this memorial, built near Wauba Debar's grave. At the Australian federal election, 2016 the Bicheno booth recorded the following number of votes for each party: Liberal 278 (46.88%), Labor 178 (30.03%), The Greens 85 (14.33%), Recreational Fishers 44 (7.42%), Renewable Energy 6 (1.01%) & Christian Democrats 2 (0.34%). In the 2016 Census, there were 943 people in Bicheno. 76.6% of people were born in Australia and 86.0% of people only spoke English at home. The most common responses for religion were No Religion 37.7% and Anglican 23.7%. ^ a b c Australian Bureau of Statistics (27 June 2017). "Bicheno (State Suburb)". 2016 Census QuickStats. Retrieved 27 January 2018. ^ Kathryn Evans, Shore-based whaling in Tasmania: historical research project; Volume 2; site histories, Tasmanian Parks and Wildlife Service, Hobart, 1993, p.54-5. This page was last edited on 12 March 2019, at 02:00 (UTC).